M.J. R.I.P. 1958-2009 When I arrived in New York news of Michael Jackson's death filtered across the city. That breaking news was reflected on the walls of the Hall of Fame. Below, are some pics of the tribute pieces that were painted over the weekend. Uptown, Downtown I went uptown on Friday when only a few heads were painting and got inside the yard to take a closer look. Then I went again on Saturday and Sunday to see Tat Cru paint, but still no sign of them! All I got was this teasing mural and a couple of thunderstorms! "I miss the old New York" As I reflect on my first visit I have to say I probably won't go again. The writers want to get up, but some of them don't want to be seen doing it. It's taking the adage "I miss the old New York" to an extreme. The old skool cats (~50 years old) are happy to chat, but the 30+ year olds still think it's the wild west out here. They hate the bloggers, the photographers, the videotographers. Aka me. And if they find out you're not from New York...oh man, get outta here! Big up to Ink76, Band1 and the man James Top for giving me some camera love. Popmaster Fabel is that me in the Cheech Wizard shirt...word! I went to see the last day of the "Whole in the Wall" show in Helenbeck Gallery, midtown Manhattan. As I wandered around the huge, but empty gallery space I saw works from the New York greats: Blade, Daze, Lee Quinones, Quik and Rammellzee. They seemed alone in such a big gallery and a little soul-less compared to the packed scene at the launch party. Star spotter Things liven up as Crash arrives and hangs out with the galleryowners and is soon joined by Sharp. The doorman (Sharp's godfather) helps me get their tags for my collection. These are guys are New York graffiti illuminati if you don't know! Antiquities The most interesting room was on the second floor. A room that brought together the "old and new masters" featuring French 17th- and 18th-Century (reproduction Louis XVI) furniture...all gold and baroque shapes counter-balanced by bright chaotic works from Sharp. "Tools of War" host a series of park jams to recreate the hip hop vibe from the 80s. As I rolled into New York on the redeye DJ AJ Scratch (Kurtis Blow's D.J.) was billed to spin alongside Popmaster Fabel of the Rock Steady Crew in the South Bronx St. Ann's Park. I passed through with my cameras and watched the breaking, the DJing and a tribute to Michael Jackson (shocking news of his death came through that evening.) Seeing AJ spin some classic jams was cool, even though he's rusty and didn't stray far from "The Ultimate Breaks and Beats" catalog. Black Spades Real old skool heads turn up at these jams. This was one of the smaller ones, but Jazzy Jay was there. GrandMaster Caz was on the mic. And, also the Black Spades community group. The same infamous Black Spades gang of the south Bronx that Afrika Bambaataa was a member of. 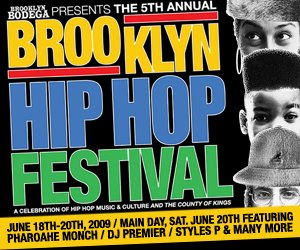 According to the "Beat This: A Hip Hop History" documentary series, watching Michael Caine in the film "Zulu" was the inspiration Bambaataa to creating the "Zulu Nation" as a organization to uplift the youth out of the despair they lived every day, using hip hop as its messenger. Thanks to Christie Z. for organizing these park jams and keeping the vibe alive! Worldwide Today, the Zulu Nation has spread worldwide with chapters in Belgium, France, Sydney, Tokyo and the UK, amongst others. I still remember the London chapter was run by a guy named Dapo. There was an air of exclusivity and no one I knew was a member which meant there seemed to be some some anamosity towards the Nation from regular b-boys. 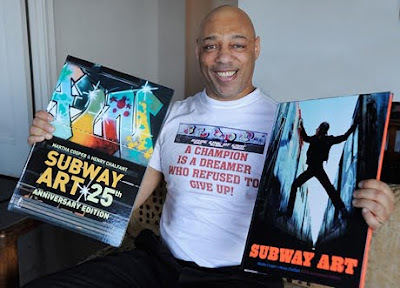 The 25th Anniversary edition of "Subway Art" was launched at Helenbeck Gallery in New York last week amongst the "Whole in the Wall" art exhibition, 1970 - Now. There's a cool video below. I also blogged about my visit to the show. Check it out. "...a subculture of less than 200 people to eventually a global movement of 1000s..." Sharp. 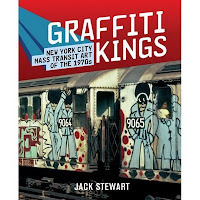 Below is a classic interview with Henry Chalfont and Martha Cooper about Subway Art and the new 25th anniversary edition. I won't reach this year, but I'm sending some sun to NYC from LA...I hear rain might delay play. Stay dry kids! "S-L-I-C-K, Slickster, OG Slick, Slick Muthafucka, Senor Slick..."
The mighty Breakestra brought the funky breaks to Echo Park, Los Angeles last week for the opening of The Root Down at El Cid club, its new home. It was a sweaty night as fans of good music jiggled to the obscure tunes from the 70s. Music Man Miles says there's more stage and dancefloor square footage at El Cid :) It was a great night out since I haven't seen Breakestra play live since around 2006 at a Scion gig. 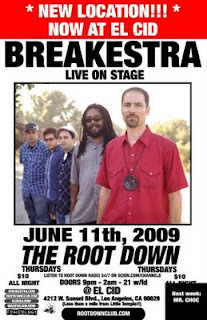 Diggin' in the crates After searching and searching I still couldn't find the name of the original tune sampled by Stezo for "To the Max" that Breakestra played (4.00 mins in on the video.) Until now..."Soul Tambourine"﻿ by Bettye Lavette. Phew...Thanks Broolkeez for spilling the beans! If you don't know Stezo check him below. Ah, my youth, right there! Breakestra @ El Cid, Los Angeles 2009 from stevio on Vimeo. Just (Baby break it on down) to the max"
Even my Dad knows what's up. Bristol, baby! 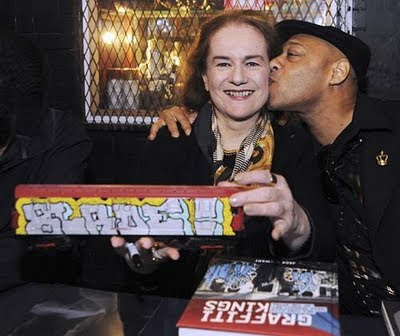 "This is the first time tax payers' money has be used to put my art on the wall, rather than scrape them off it..."
My UK heads hit me up to a dope Q-Tip mixtape from J.Period of NYC. So, I paid attention when J.Period posted a video of his remix session with K'naan. He's been getting US love of late and been seen on BET freestyle sessions. Mistaken identity For a minute I thought K'naan was British Somalian (yes, they exist,) but his accent pointed me in the direction of New York (and now Toronto.) And you can tell by his flow and rhyme references. Check him out, he's hot! J.PERIOD VIDEO BLOG :: IN STUDIO WITH K'NAAN (LA) from Truelements Music on Vimeo. 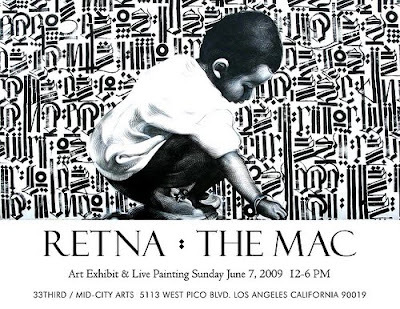 I didn't get to see Retna and El Mac paint, but I was there early and watched Kofie and Codak put up their collaborative piece. Here's Kofie's time-lapse video of him painting a character from his sketch book. Mid City Arts Backwall: Live art time lapse from Augustine Kofie on Vimeo. This website should help decipher the linguistics and code used in rap. However, since it's a wiki it's only as good as the audience and the entries kinda fell off when I scrolled back to the 80s?! :) What? It seems that only youngsters are online!? Wieden+Kennedy put some ol'skool hip hop to use in this cool public service announcement. Origin has called out the obsession with cash money with its latest t-shirt design. Forget Billionaire's Boys Club...get Origin! Nilliønaire "Are you a captain of industry? A wealthy philanthropist? Big money baller and shot caller? Yeah, neither are we. Here's to the low-life."